The Bresser AR 102 is a beautiful second hand absolutely as new optical tube assembly only (ie no mount). 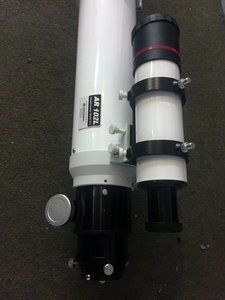 It is a 4" refractor, with the Bresser Hexafoc system. The focal length is 1350mm, making it an f13.2. It has an 8x50 finder. There will also be a 1.25" diagonal and a couple of basic eyepieces. The scope excels on the Moon and planets. I was using it to view Mars last week, and it gave a very satisfactory image, nicely sized in an 11mm Explore Scientific 82 degree eyepiece, albeit I couldn't see any details because of the dust storm. Maybe a hint of the Syrtis Major, but I might have been imagining it. Saturn was very nice as well. It is quite good on deep space objects as well, I got a lovely sharp view of the double cluster with it, and also a cracking view of Albireo and a few other double stars.